Politics today is marked by tension between claims of universal human rights and diversity. From the war on terror to immigration, one of the major challenges facing liberalism is to understand the scope of equality in a world in which certain peoples are perceived to reject and/or violently resist democratic principles. This book revisits Europe’s initial encounter with the Native Americans of the New World to shed light on how the West’s initial defense of so-called ‘barbarians’ has influenced the way we think about diversity today, and elucidate the arguments of exclusion that unconsciously permeate the moral world we live in. 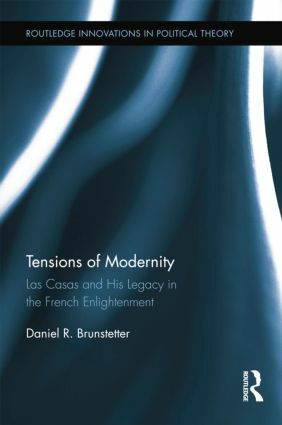 In doing so, Daniel R. Brunstetter traces Bartolomé de Las Casas’s oft heralded defense of the Native Americans in the sixteenth century through the French Enlightenment. While this defense has been rightly lauded as an early example of human rights discourse, tracing Las Casas’s arguments into the eighteenth century shows how his view of equality enabled arguments legitimizing the annihilation by ‘just’ war of those perceived to be ‘barbarians’. This philosophical narrative can be useful when thinking about concepts such as just war, multiculturalism, and immigration, or any area in which politics confronts radical difference. "Daniel Brunstetter’s book examines a profound and problematic theoretical divide in early writings about the Native American "Other" that directly shaped debates about the status of indigenous peoples well into the Enlightenment. Brunstetter thereby reveals how early modern thought framed later discussion in ways that challenge some of the most enduring conceits of modernity. Tensions of Modernity represents a novel and stimulating approach to problems of continuing importance for understanding Western conceptions of Otherness. The book is sure to find a wide and enthusiastic readership among political theorists, historians, anthropologists, philosophers and cultural theorists, including not only advanced scholars but also graduate and undergraduate students." "For half a millennium, from the Spanish Conquest to the Gulf War, the West has been faced with "Others" conceived of variously as inhuman beasts, savages, barbarians, or, at best, humans equal-but-still-somehow-unequal. What Daniel Brunstetter shows in this darkly enlightening text is the extent to which even supposed Western heroes of toleration, anti-racism, and multiculturalism, like Las Casas and Vitoria, ultimately endorsed a Euro-normative hierarchy of Christian values, rights, and personhood. In the end, the brutal choice has too often come down to "Assimilate or die" (physical genocide) or "Assimilate and die" (cultural genocide). The historic lessons for today’s crusades, both external and internal, are—or should be—all too painfully clear." 1. Introduction: Modernity and the Other: A Story of Inequality 2. Locating the Other in the Political Debates of Early Modernity 3. Thinking and Rethinking the Equality of the Other: Vitoria, Sepúlveda and the True Barbarians 4. Las Casas and the Other: The Tension between Equality and Cultural Othercide 5. From the Civilizing Mission to Irreconcilable Alterity: The Changing 6. The Other Side of Modernity: Rationalizing the Transition from Cultural Othercide to Physical Othercide 7. Conclusion: Lessons for the Future – Quo Vadis? Daniel R. Brunstetter is Assistant Professor in Political Science at the University of California, Irvine. His current research interests include early modern political thought, just war theory, French political thought in the Enlightenment, immigration in France, and narratives of the Silk Road.